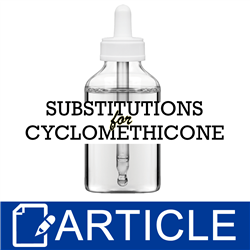 The silicone we call cyclomethicone can be one of three cyclic or “closed loop” versions, the name of which is based on the number of repeating silicone-oxygen units in the molecule. Cyclotetrasiloxane or D4 has four repeating units; cyclopentasiloxane or D5 has five repeating; and cyclohexasiloxane or D6 has six repeating. The cyclomethicone we buy is generally 95% + D5, up to 0.1% D4, and up to 4% D6. Why is cyclomethicone so ubiquitous? It’s a very light, non-greasy, silky emollient with excellent spreading properties for hair and skin. It appears matte in moisturizers, sera, and primers, and doesn’t build up on hair. There’s general agreement about the environmental concerns about D4, but not so much when it comes to cyclopentasiloxane. Environment and Climate Change Canada concluded that, “siloxane D5 is not harmful to the environment,” while Australia noted it’s persistent and bio-accumulative. 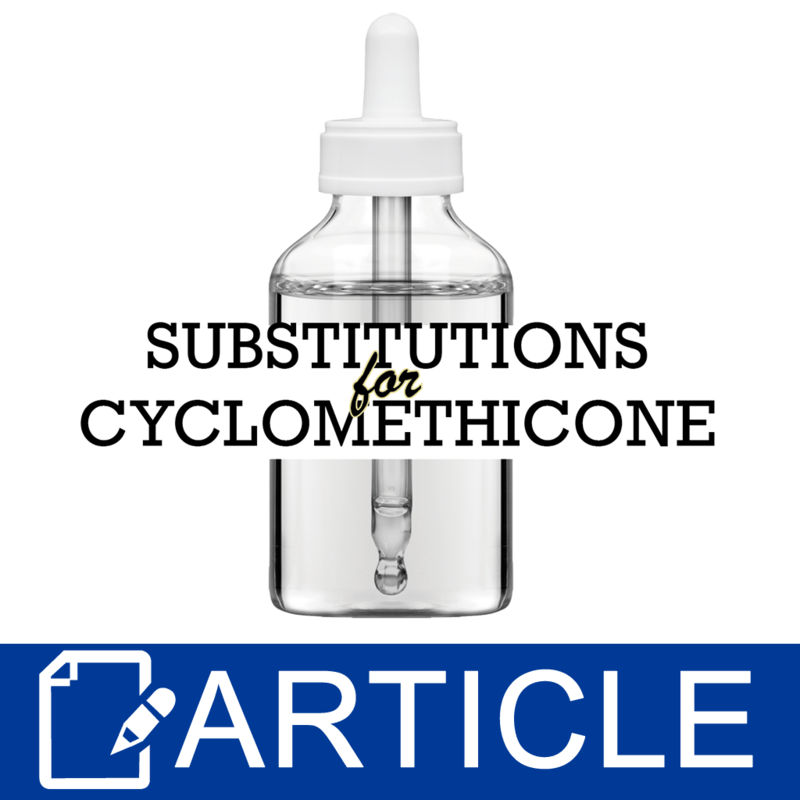 If you’re concerned about using cyclomethicone, what can you use instead? There isn’t a one-size-fits-all answer: What we choose depends on what it brings to the party. One product might be all about the non-greasiness and matte appearance, while another might need a silky and powdery skin feel. When it comes to choosing oils, good substitutes would be those considered dry and light, such as caprylic/capric triglycerides, meadowfoam seed oil, macadamia nut oil, hazelnut oil, evening primrose oil, and up to 5% isopropyl myristate. I make a super simple yet decadent body oil with 33% IPM, 33% MCT, 33% sesame seed oil, and 1% essential or fragrance oil, which is non-greasy, light, and silky. Tucuma butter is said to have a “silicone like” skin feel, and babassu oil is simply luxurious, non-greasy and silky. These can be used as part or all of the oil phase in an emulsion, emulsified scrub, or anhydrous product, alone or in combination. Adding a powder, like tapioca starch, arrowroot powder, or Crafters Choice™ Slick Fix - Oil Locking Powder, to a lotion or anhydrous product reduces greasiness and increases glide, as do treated sericite micas or silica microspheres. Clay can have that effect, but it’s best to save it for dry masks or body powders as it’s hard to preserve in lotions and creams. In my favorite anhydrous eye shadow primer stick, I’ve mimicked the properties of cyclomethicone by combining caprylic/capric triglycerides, IPM, mango butter, 3% Slick Fix - Oil Locking Powder with 15% Crafter's Choice Matte White Pigment Powder - For Oil to give me a nice white base for all my vivid, shiny colors. Hair care products are the hardest substitutions as it’s used in all kinds of conditioners, anti-frizz products, and heat protecting sprays as it helps distribute all those lovely botanicals, proteins, and vitamins more evenly, and acts as an emollient without making hair look or feel greasy. Choosing a very light to light oil or ester will work well for all but the oiliest or finest hair types. When formulating a conditioner or lotion, using Crafter's Choice Emulsifying Wax – conditioning results in an emulsion with a powdery, silky hair or skin feel, to which you can add silk amino acids, Honeyquat, or a very light oil to increase slip and glide. I admit it’ll be hard for me to re-formulate some of my favorite as it has become a staple in my workshop, but if I keep in mind which properties I’m hoping to emulate, experiment a lot, and gift many samples on my testers for feedback, I’m sure I’ll be saying cyclomethicone schmyclomethicone before you know it! "I use cyclomethicone in my bug spray. Do you have any suggestions on what I can use instead?" Staff Answer At this time we do not have a recommended replacement. We are testing several alternatives and hope to have something soon. "Is dimethicone an environmental issue as well? " Staff Answer We are told it is.